If you've been around for any amount of time, you've probably noticed that I wear dresses and skirts waaay more than I wear pants. In fact, my students will ask me (on the days I wear pants) if I don't feel well! I don't know what it is...I just feel like my body type looks best in a skirt or dress! 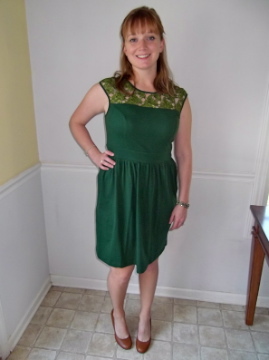 When eShakti contacted me about doing a product review for them, I got super excited. Ladies, their dress selection is out of this world! Not to mention, you can custom order any of their pieces by sending in your own measurements. I had a really hard time narrowing down my pick, but decided on this green number because I felt it could be dressed up or down. Let's face it, I don't have many fancy shindigs to attend. I can wear this dress with tights, boots, and a denim jacket to dress it down for work or I could pair it with patterned tights, fancy heels, and an updo for a night out. I adore the floral detailing around the neckline. Amazing perk...pockets! Not to mention its a jersey fabric (you'd never guess by looking at it) so its uber comfy. Check out eShakti - you won't be disappointed. By the way, you also get $25 off your first purchase. So pretty! Love the shade of green especially with camel wedges! I also wear dresses and skirts more than pants - at least in the spring, summer and fall! That is a beautiful dress! In the summer I am primarily skirts and tanks, but in the winter...it is just too cold where I live for dresses and I am in pants all.the.time. Green is so pretty on you! Love the dress! I agree-- green is a great color on you. I have heard that website is tricky with returns. that dress looks so good on you! I love the color of it! Love everything about this look. You can seriously rock the green. Beautiful! !